Pythagoras affirmed that the Nine Muses were constituted by the sounds made by the seven planets, the sphere of the fixed stars and that which is opposed to our earth, called the "counter-earth." He called Mnemosyne, or Memory, the composition, symphony and connection of them all, which is eternal and unbegotten as being composed of all of them. 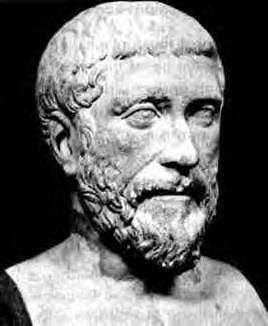 Pythagoras, desiring to become acquainted with the institutions of the Egyptian priests, and diligently endeavoring to participate therein, requested the Tyrant Polycrates [of Samos] to write to Amasis, the King of Egypt, his friend and former host, to procure him initiation. Coming to Amasis, he was given letters to the priests, but the priests of Heliopolis sent him on to those at Memphis, on the pretense that they were the more ancient. On the same pretense, he was sent on from Memphis to Diospolis [ancient Thebes]. From fear of the King, the latter priests dared not make excuses to initiate Pythagoras, but thinking that he would desist from his purpose as a result of great difficulties, they enjoined on him very hard precepts, entirely different from the institutions of the Greeks. These he performed so readily that he won their admiration, and they permitted him to sacrifice to the Gods, and to acquaint himself with all their sciences, a favor never previously granted to a foreigner. Pythagoras purportedly remained in Egypt for about 22 years, but in 525 B.C., Egypt was conquered by the Persian King Cambyses. The Persian King deported most of the learned men of Egypt to Babylon, including Pythagoras. After about 12 years in Babylon, Pythagoras was allowed to leave. In Egypt he frequented all the temples with the greatest diligence, and most studious research, during which time he won the esteem and admiration of all the priests and prophets with whom he associated. Having most solicitously familiarized himself with every detail, he did not, nevertheless, neglect any contemporary celebrity, whether a sage renowned for wisdom, or a peculiarly performed mystery. He did not fail to visit any place where he thought he might discover something worthwhile. That is how he visited all of the Egyptian priests, acquiring all the wisdom each possessed. He thus passed twenty-two years in the sanctuaries of temples, studying astronomy and geometry, and being initiated in no casual or superficial manner in all the mysteries of the Gods. At length, however, he was taken captive by the soldiers of Cambyses, and carried off to Babylon. Here he was overjoyed to be associated with the Magi, who instructed him in their venerable knowledge, and in the most perfect worship of the Gods. Through their assistance, likewise, he studied and completed arithmetic, music and all the other sciences. After twelve years, about the fifty-sixth year of his age, he returned to Samos. After a brief visit to his home in Samos, he finally settled in southern Italy at Crotone. At Crotone, Pythagoras established a secret society that was said to be similar to groups associated with the Orphic mysteries. Pythagoras became involved in the cultural life of Crotone and formed an elite circle of followers. His group observed very strict rules of conduct; however he accepted female students on an equal basis with the males. Those who joined the inner circle of Pythagoras's society called themselves the Mathematikoi. They lived at the school, owned no personal possessions and were required to practice a vegetarian diet. Other students who lived in nearby areas were also permitted to attend Pythagoras's school. Known as Akousmatics, this outer circle of students were permitted to eat meat and own personal belongings. The Pythagoreans observed a structured life involving religious teaching, common meals, exercise, reading and philosophical study. Music was an integral feature of this life. The group members would sing hymns to Apollo on a regular basis; and it was said that they could use the Lyre to cure illness of the soul or body. Poetry recitations were frequently held both before and after sleep to aid the memory. The major focus of the school was the study of mathematics - in particular number theory and geometry. The Pythagorean theorem purportedly was proved either by Pythagoras himself or by one of his students. However, the earliest known mention of Pythagoras's name in connection with the theorem occurred almost five centuries after his death, in the writings of Cicero (106-43 B.C.) and Plutarch (46-127 A.D.). Pythagoras, in strict accordance with the policies of the Egyptian and Babylonian temple schools, treated his knowledge with great secrecy. No knowledge of importance could be written down. Significant Pythagorean ideas were communicated on an oral basis only. Therefore, Pythagoras left no written works whatsoever. Accordingly, the best written description of the Pythagorean Weltanschauung is contained in the writings of the famous Pythagorean initiate, Plato. In the latter part of his life, Plato decided to impart at least some aspects of the Pythagorean belief system in his written dialogues, particularly in his dialogue entitled the Timeaus. However, to insure that this knowledge would be inaccessible to the uninitiated outer circle of mankind, he imparted the knowledge in a heavily encrypted format, which to this day has never been successfully deciphered. In modern times, probably the one person who came the closest was the renowned M.I.T. humanities professor and historian of science, Giorgio de Santillana (1902-1974).